This short app note gives a worked example of the gain structure optimization procedure described in the DDRC-88A User Manual. 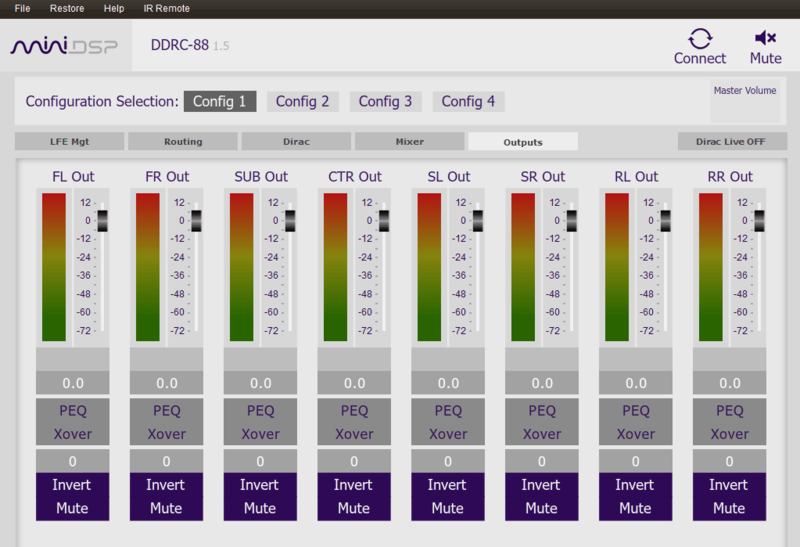 If the Output & Levels tab in Dirac Live Calibration Tool for miniDSP shows a large difference in the measured sound level for different channels, it would be a good idea to run the gain structure optimization procedure described in Section 6.3 of the DDRC-88A User Manual. The purpose of the procedure is to adjust the output gains of the DDRC-88A and following equipment to avoid problems with low output levels or clipping. On the Output & levels tab, run the test signal on the first channel. Set Output volume and Input gain so that the meter reads half-way on the green bar, at −12 dB. Figure 1. DDRC-88A Output and Levels tab. Run the test signal on the other channels and note the level. Don't touch the Channel volume sliders! (Leave them at maximum.) In Figure 2 below, the meter readings are shown in the "Before" column and the corresponding levels are written down in the "Reading" column. Now we can calculate the amount we want to adjust each channel: Change = Target − Reading. Figure 2. Measured levels and gain adjustments. Changed the connection to the subwoofer from unbalanced to balanced. This gave us an extra 12 dB of output gain, so we then adjusted the gain control on the amplifier down by 8 dB. Flipped the output DIP switches for the surround channels from the "UP" position to the "DOWN" position (changing output gain setting from 2V to 0.9V). With that all done, going back to the Output & Levels tab gave the meter readings shown in the "After" column of Figure 2. It's not necessary to get the meter readings as close as we were able to in this example. The aim of the procedure is to get the gain structure more consistent across channels and avoid major issues — it's not necessary or useful to get the readings down to the last dB. Enjoy your DDRC-88A! If you run into problems with this procedure, feel free to ask on our forum.